Nearly three years after Powell City Council approved final development plans for a bed and breakfast at the northwest corner of the East Olentangy Street and Grace Drive intersection, Gene Rodriguez — the mastermind behind the project — remains dedicated to making his dream a reality. Rodriguez, who owns the property in question at 80 E. Olentangy St., has vowed since Jan. 20, 2015 to convert his current home (built in 1908) into The Day Dream Inn — a premium bed and breakfast featuring 10 suites. “I really believe it’s the highest and best use for that corner,” he said. During Wednesday’s Powell Planning and Zoning Commission meeting, Rodriguez told members the last two-plus years have been tough on him physically, which has hampered his efforts to secure investors for the project. “There are a lot of reasons I haven’t gotten the funding in place,” he said. “Primarily, my physical condition is preventing a lot of energy from being expended. “I have met investors who are interested. What they want is a seasoned partner who knows the hotel business. That’s really my challenge is to find someone that likes the project and is qualified to take the lead on it,” he added. 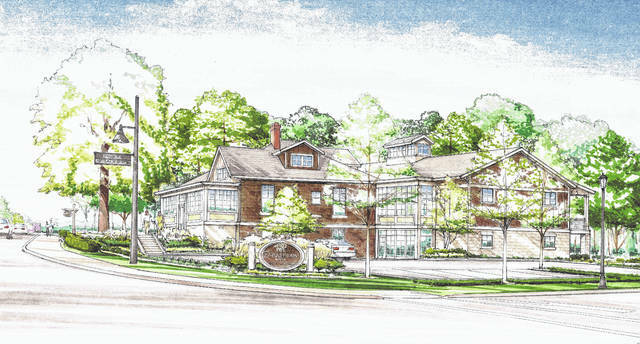 At the request of Rodriguez, commission members voted in favor of a another one-year extension on the approved final development plan from 2015 for The Day Dream Inn. The approval means Rodriguez can proceed with the planned project as long as construction begins by January 2019. “If no more shoes drop, we should be able to get this done,” Rodriguez said. Commission members like Bill Little are hopeful the inn will one day stand at the corner of East Olentangy Street and Grace Drive. “What we have here is a really nice use of the property and a really nice design,” he said. Local architect Thomas Coffey presented to the commission a sketch plan for a proposed real estate office destined for the vacant lot next to More Time for You on South Liberty Street. Coffey said while the plans are just starting to develop, Powell resident Steve Wilke is interested in moving his Dublin-based real estate office to the Liberty Street Business Park. Along with a 2,554-square-foot office on the first floor, the sketch plan calls for two, two-bedroom apartments to be built on the second floor, each totaling 1,277 square feet. Coffey said the apartments would be geared toward single professionals. Little agreed with city staff’s take on the project. “I think it’s a good example of mix use,” he said. Following Coffey’s presentation, the commission voted in favor of allowing the applicant to submit a combined preliminary and final development plan for the project at a later date.